TALK RADIO: Attorney Chris Davis On Vicious Dog Attack On UPS Driver Talk radio host Dori Monson discusses a recent dog attack on a UPS driver with Washington State dog bite attorney Chris Davis. 9/22/17 - KIRO RADIO - Talk radio host Dori Monson discusses a recent dog attack on a UPS driver with Washington State dog bite attorney Chris Davis. Mr. Davis gives some background on the victim, the circumstances of the attack, the damages incurred and what the next steps in the case are. Get your complimentary copy of "When The Dog Bites: The Essential Guide To Dog Bite Claims In Washington" absolutely free by clicking the "Order Now" button below. 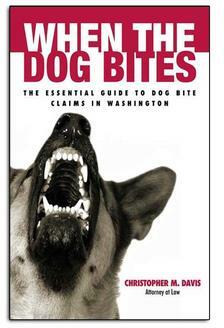 Award-winning dog bite attorney Chris Davis has written a series of FREE books, including one about dog bite cases in Washington state. These books answer common legal questions that people and their loved ones may have about their legal rights, including how to handle your claim on your own and when you might need an attorney's help.